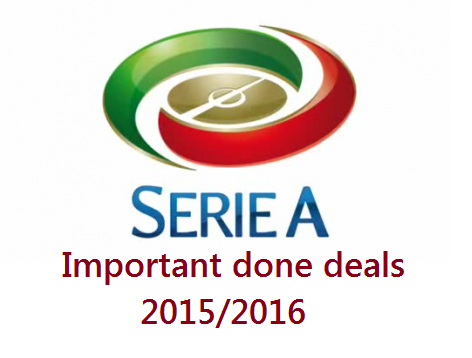 Serie A - Important Done Deals 2015-2016: Check out all the completed transfer so far in the Serie A. Juventus, AC Milan, Inter Milan and Napoli all completed transfers. Midfielder Simone Verdi for £0.3 million from Torino. Forward Luiz Adriano for £5.6 million from Shakhtar Donetsk. Midfielder Jose Mauri for free from Parma. Defender Rodrigo Ely for free from Avellino. Midfielder Andrea Bertolacci for £14 million from Roma. Defender Alessio Romagnoli for £18 million from Roma. Forward Carlos Bacca for £22 million from Sevilla. Forward Mario Balotelli on loan from Liverpool. Midfielder Juraj Kucka for £2.5 million from Genoa. Midfielder Mario Suarez for undisclosed fee from Atletico Madrid. Goalkeeper Luigi Seppe on loan from Napoli. Defender Gilberto for £0.7million from Botafogo. Defender Davide Astori on loan from Cagliari. Forward Nikola Kalinic for £3.6 million from Dnipro. Midfielder Jakub Blaszczykowski on loan from Borussia Dortmund. Midfielder Geoffrey Kondogbia for £28.31 million from Monaco. Defender Martin Montoya on loan from Barcelona. Midfielder Jonathan Biabiany for free from Parma. Defender Joao Miranda on loan from Atletico Madrid. Defender Jeison Murillo for £5.6 million from Granada. Defender Felipe Melo for £2.5 million from Galatasaray. Defender Alex Telles on loan from Galatasaray. Midfielder Adem Ljajic on loan from Roma. Forward Stevan Jovetic on loan from Manchester City. Midfielder Ivan Perisic for £13 million from Wolfsburg. Goalkeeper Norberto Neto for free from Fiorentina. Forward Guido Vadala on loan from Boca Juniors. Forward Paulo Dybala for £22.6 million from Palermo. Forward Mario Mandzukic for £13.5 million from Atletico Madrid. Midfielder Roberto Pereyra for £10 million from Udinese. Midfielder Sami Khedira for free from Real Madrid. Forward Simone Zaza for £13 million from Sassuolo. Forward Alberto Cerri for free from Parma. Defender Alex Sandro for £18.7 million from Porto. Midfielder Mario Lemina on loan from Marseille. Midfielder Hernanes for £8 million from Inter Milan. Midfielder Juan Cuadrado on loan from Chelsea. Defender Wesley Hoedt for free from AZ Alkmaar. Midfielder Ravel Morrison for free from West Ham. Defender Patric for free from Barcelona. Midfielder Ricardo Kishna for £2.8 million from Ajax. Forward Alessandro Matri on loan from AC Milan. Midfielder Mirko Valdifiori for £3.5 million from Empoli. Midfielder Jorginho for £3 million from Verona. Midfielder Allan for undisclosed fee from Udinese. Goalkeeper Gabriel on loan from AC Milan. Defender Vlad Chiriches for £3.5 million from Tottenham Hotspur. Defender Elseid Hysaj for undisclosed fee from Empoli. Defender Nathaniel Chalobah on loan from Chelsea. Midfielder Andrea Bertolacci for £6 million from Gernoa. Midfielder Leandro Paredes for £3 million from Boca Juniors. Forward Iago Falque on loan from Genoa. Midfielder Radja Nainggolan for £10 million from Cagliari. Goalkeeper Wojciech Szczesny on loan from Arsenal. Midfielder Mohamed Salah on loan from Chelsea. Defender Norbert Gyomber on loan from Catania. Defender Antonio Rudiger on loan from Stuttgart. Forward Edin Dzeko on loan from Manchester City. Defender Emerson Palmieri on loan from Santos. Defender Lucas Digne on loan from PSG. Midfielder William Vainqueur for £2.2 million from Moscow. Forward Ezequiel Ponce for £3 million from Newell. Defender Ali Adnan for £1.7 million from Iraq Rizespor. Forward Duvan Zapata on loan from Napoli. Midfielder Manuel Iturra for undisclosed fee from Granada. Midfielder Marquinho for undisclosed fee from Roma.